The exhibit features 15 international artists and collaborators, including Manuel Baez, Sarah Berube, Robert Bosch and Sage Jenson, Jean-Marc Castera, Marc and Marion Chamberl, Laura De Decker, Bathsheba Grossman, Colin Liotta, Vincent J. Matsko, Kerry Mitchell, Janna Schimka, Rolf Schmuck and Markus Schwehm. Co-curators Tim Korb (former assistant head in the Department of Computer Science) and Petronio Bendito (associate professor of visual communication design) gave remarks at the reception. “Intersection of Art and Science II” is a joint collaboration between the Department of Computer Science and the Patti and Rusty Rueff School of Design, Art and Performance. The featured art examines a wide range of expressive approaches that emerge in the intersection of art, science and technology. 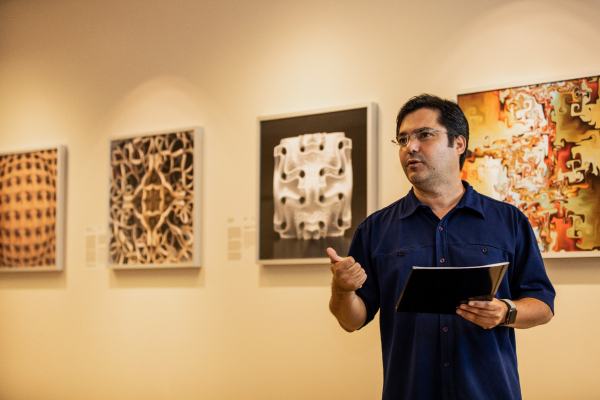 Some of the works have a connection to computer science education and art history in the incorporation of binary concepts, fractals, 3D printing and quantum computing. Intended to promote collaborations and interdisciplinary thinking, the exhibit will help students and viewers engage with the increasingly growing role that computational and visual processes play in the creation of real and virtual experiences. Located on the third floor of Lawson Computer Science Building outside Room 3102, the exhibit will run through December 20, 2019. It is free and open to the public. View photos from the opening reception on Facebook.